Depression has been hanging on me with the sticky hot blanket of humidity that is Virginia summer. I spend my days doing very little, mostly sleeping and hating myself for it. I'm just never going to a be summer person. I've been drepressed and am trying to shake it. I decided to take pics of all the little things throughout the day that make me happy. My favorite beagle in my new favorite corner. Finding my grandma's glass juicer. Excited that I'll soon be able to make chive blossom vinegar. 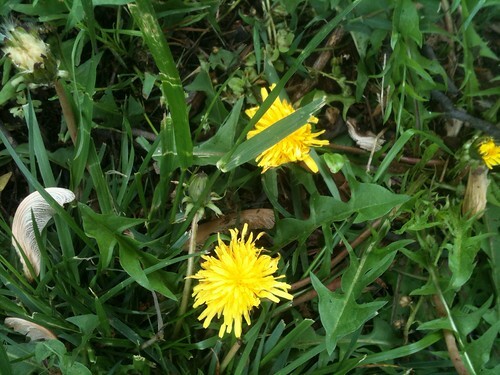 I'm going to make dandelion salve too. The mock orange is in bloom. He's not Petey, but he needed a home., originally uploaded by homebodylynn. 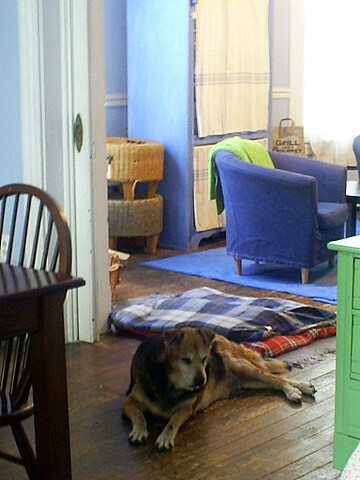 Wednesday, after my weekly posting about Petey on Craig's List, I got an e-mail from someone telling me they were sure they saw my dog at Chesterfield's animal shelter. We didn't hold out much hope it was him. In the months we've been looking for him, it has become apparent to us that, to people who don't own Boston's, they all look the same. I've lost count of the number of times people have told me they saw a dog who looked exactly like mine, but when I saw the dog it didn't look like Petey at all. At least not to me or Bee. So it wasn't a big disappointment when Bee went over to the shelter and the dog wasn't Pete. We hadn't been overly hopeful. 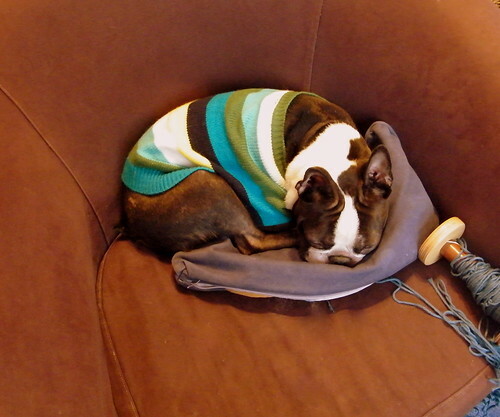 This wasn't a ten year old black and white Boston, but a two year old brindle/brown and white Boston. A real cutie too! What we didn't expect was how quickly Bee would take to him. 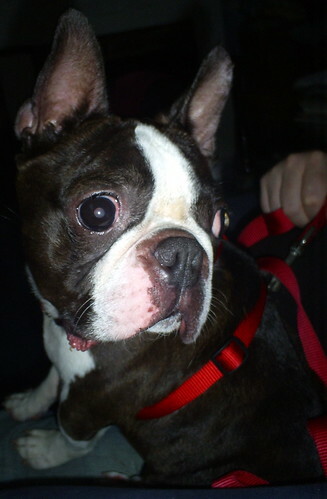 We've found a couple other Boston's while looking for Pete and weren't tempted to keep them. We even went out a couple weeks ago to look at a little dog ( some kind of pug mix- a very nice dog) with idea of maybe bringing him home. M.E. really wanted another pup, but we just haven't taken to another dog. I also didn't want Pete to come home and find a usurper. But Bee said it was hard to leave the shelter without this little boy. He really wanted me and M. to go back and meet him yesterday. You can see he won all our hearts, because he's home with us now. He's very good natured and in pretty good health. The vet told us he's suffering from malnutrition so we need to give him lots of good quality dog food. Easy enough. Unfortunately, with the exception of being housebroken, he doesn't seem to know much about being on a leash or living with people. We have our work cut out for us teaching him good manners. M. is excited about helping out. She went to the library with her grandmother today to check out dog training books. It's good to see her so happy. He really is a cheery little dog. Even the teen perks up when he sees our newest family member. Petey is Gone, originally uploaded by homebodylynn. 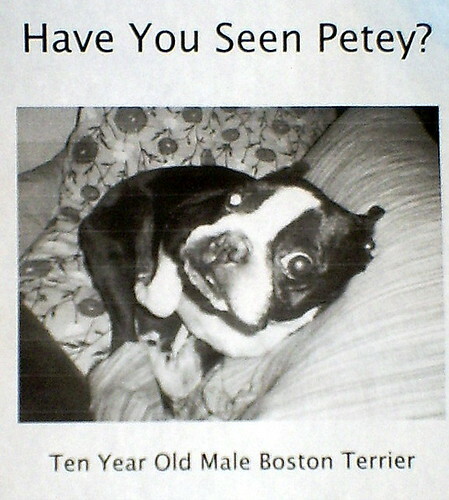 Our little dog Petey disappeared from our backyard (the Museum District of Richmond VA) Wednesday night (July 2nd) and nobody in our neighborhood seems to have seen him. We've posted on Craig's list and put fliers out and visited the pound and called the SPCA and all the nearby vets. There were no open gates (our gates are padlocked- so nobody could have opened one and shut it behind them) or holes in our privacy fence and he's too small to have jumped the fence. There are no clues or trails to follow to find him. We're broken hearted and worried sick about him. 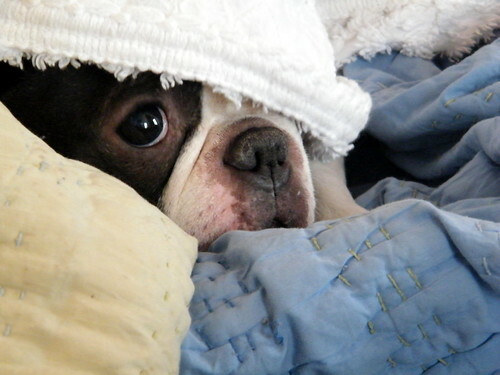 He's a ten year old, black and white (with touch of brindle) twelve pound, spoiled, and very much loved ten year old, Boston Terrier. We miss him so much. 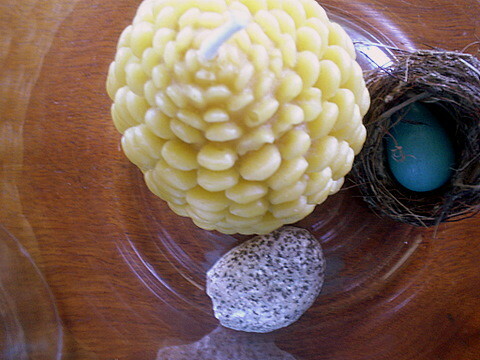 Inside the nature jar, originally uploaded by homebodylynn. I'm fiddling around with our nature table. The only spot we're not already using is this little antique table given to me by my parents. It belonged to my grandmother and, among the many old pieces of furniture I inherited from her, it's the only one that's supposed to be "good". It's small and a bit fussy ( I believe it's a wash stand) and I have no space, nor really any need, for an occasional table. It sits in front of the windows in my dining room and I worry about it getting scratched or banged up- especially since my father went to the trouble of having it professionally refinished before he gave it to me. So we've been using it as a nature table, and my little nature lover likes rocks. She's also been known to bring home chunks of broken brick and insist it go on the nature table (she's a city kid, so I guess bricks can count as nature around here) then plops it there onto the nicely refinished antique table, after which I fuss at her about hurting the table. Then I resent the table for making me worry about it. None of my other furniture makes me worry over it. Either it is painted and I can slap on more paint if there's a scratch or it's already so old and banged up, one more scratch won't be noticed. As a result, I grown to dislike that table, but my parents have nowhere to put it and they've been so generous over the years that if it makes them happy for me to take the table, I'll keep it. 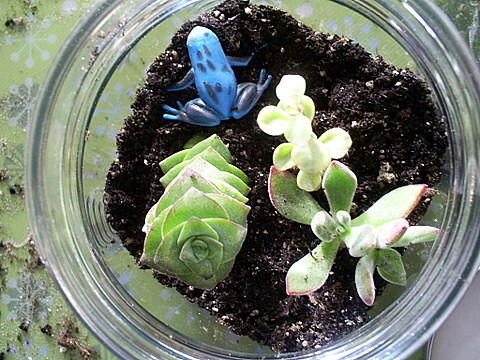 So, I thought, terrariums are nature and we like making them why not make terrariums for the nature table? We'll make one giant one or a couple middle sized ones and any acorns, feathers, little rocks and even brick pieces (as long as they're not too big) M. finds can go inside the terrariums. I love the look of those curvy old fashioned terrarium jars, but we're on a budget around here, so I just went to Target and picked-up an Anchor Hocking jar from their heritage collection. It looks old timey to me and it's nice and thick. I brought it home, put it on the table and then, just to give it a reason to be there for now, put some of the things from our nature table inside. And I love it! What was a collection of objects sitting on an old table, now looks elegant and a bit Victorian. It suits that old table and I don't have to worry about scratches. I still want to make a terrarium in my new jar, but I'm thinking I'll look around for an even bigger one to use as our nature jar. What a lot of words just to show you some stuff in a jar! 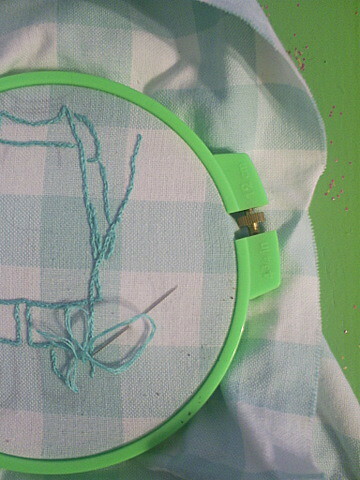 WIP Wednesday, originally uploaded by homebodylynn. I'm working on a summer tote for M. I want to make a bunch for her so she can use them for the library or going to grandmas and even to store all the little toys and bits she leaves around the house. Alley hanging out, originally uploaded by homebodylynn. Alley likes to sit right there between the dining and living rooms so she can keep an eye on everything. The weather's been so nice lately. It makes me want to start summer right now. Piles of books, lazy mornings in the backyard and breezy evenings cooking out. Of course, by the time summer really gets here, there will be humidity and stickiness and all that ridiculous heat. I won't want to hang out in the backyard. I'll never want to go out at all. The books, however, are welcome anytime.